Lavatera × clementii ‘Rosea’ – which was another gift from my mum. It was the first thing I planted in my garden and reminds me of my mum’s house where I grew up. They’re a magnet for bees too. Campion – it’s a really vivid pink – the photos don’t do it justice. The plant came in a pot from my mum’s garden a couple of years ago in a bit of a sorry state. It took a while to get going but it just keeps flowering for most of the summer. The ‘vase’ originally had risotto rice and dried herbs in it (which made a lovely dinner) and I bought it in Lidl last year and saved it for my chutney. 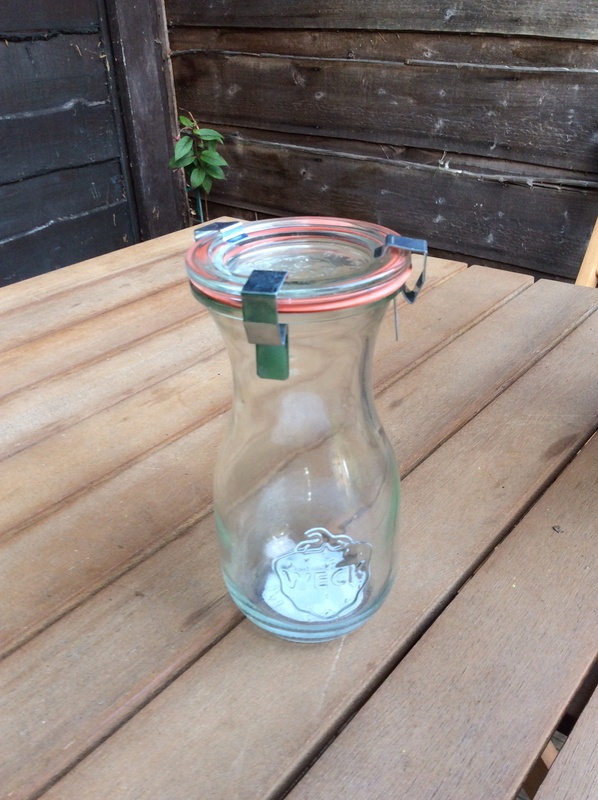 It’s a Weck Jar who are the German equivalent of Kilner, founded in Oflingen Germany in 1895. The logo is a cute strawberry. It’s about 6 inches high and it amused me that, according to their website, it’s actually a juice jar. Do have a look at all the lovely vases hosted by Cathy over on Rambling in the Garden. This week she has beautiful, restful and serene white flowers including a lovely dahlia. Anyone can join in – I enjoy looking at everyone’s vases very much and it gives me such a lot of ideas for my garden. There are some lovely dahlias in many of the vases – Particularly, I like the landaff style ones (they’re daisy style too) and I’ve got a beauty in my garden at the moment – it might appear in the vase next week. Are you going to Tatton? Do you go to other flower shows? 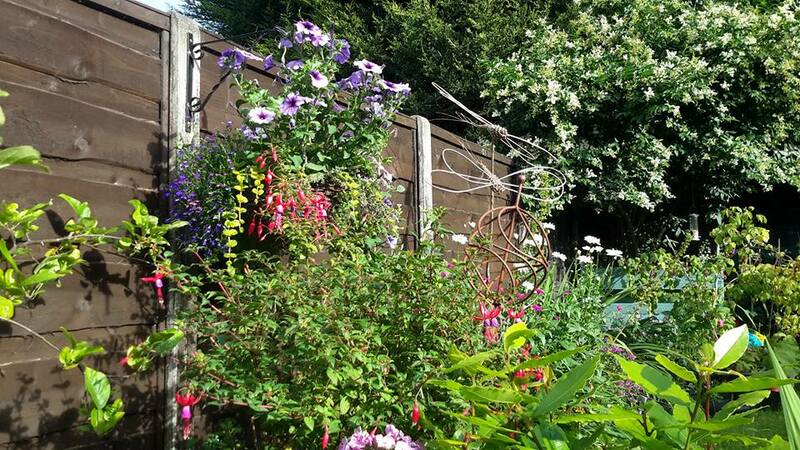 This entry was posted in Gardening, In a vase on Monday and tagged campion, dragonfly, hanging baskets, In a vase on Monday, Lavatera, mallow, marguerite, tatton park flower show, weck jar on July 20, 2015 by Bec - views from my garden bench. 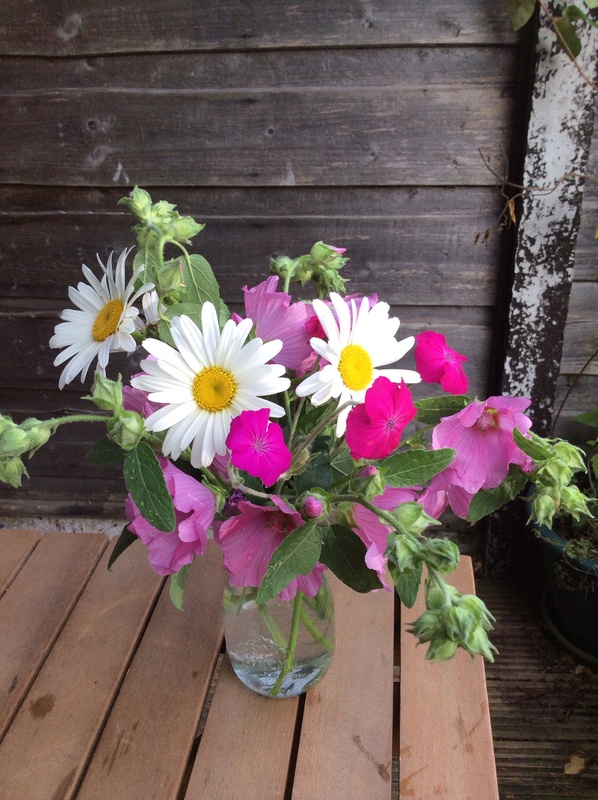 Bec what a lovely vase in the jar…such bright pink set off by the lovely white daisy! They are just beautiful. Talented craftsman. I am so envious of your garden. Mine is just green, although the buddleia looks like it’s about to bloom 🙂 Tempted to nab a cutting of our neighbours hyacinths though, they’ve gone mad this year! The white daisy sings, and the other blooms sing along. Enjoy Tatton Park…. they were really cheap Cathy (£20) the body is plated willow (and long bits of willow are bent round) and a hole left so it can be stuck on a stick – I watched the chap make one and it too about 20mins. yes when I think about my garden and plants I love alot of it comes from my mum (my dad mostly pruned and cut the grass). The original campion my mum cut a chuck off for me has been in her garden for a very long time so I think it is a cultivated one – it’s a really electric pink. Yes, I sometimes even brave Aldi on a Thursday if there is a plant I really want! What beautiful flowers. I really love the daisy type ones. 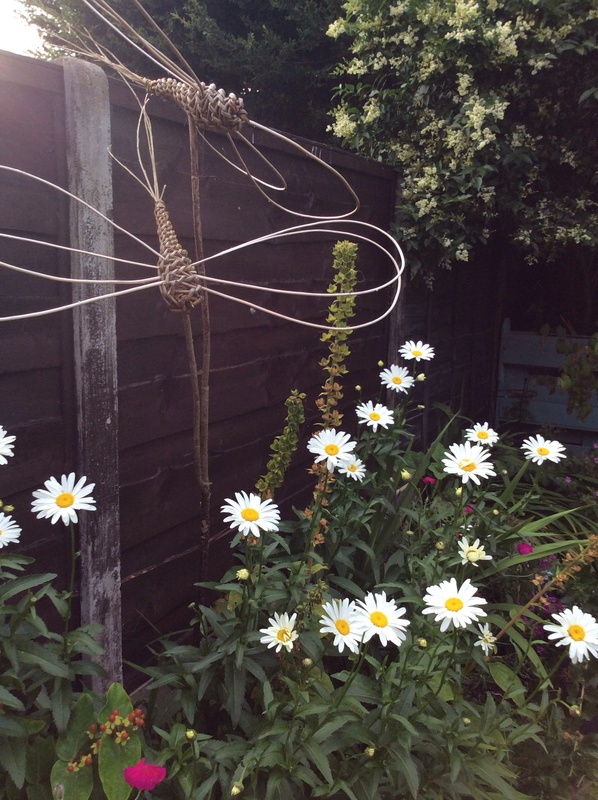 Lovely daisies and dragonflies. The white flowers seems to float. I’m Bec a 50-something adopted Mancunian. I’m a gardener, a hill walker, an outdoor enthusiast, and a bit of a geek. I have osteo-arthritis but yoga, mindfulness, and crafting help my wellbeing.